If you imagining to spend your vacation in a quiet place, clearest sea on the Adriati, with a beautiful view to the sea, a touch of majestic Mediterranean nature, friendly family atmosphere, new high-standard apartment and all that directly at the sea just above the private Beach, you have chosen right! Villa Ruzmarina is located in the fishermen's village Marusici in the heart of the Omis Riviera - a 35 km long Riviera of outstanding beauty. 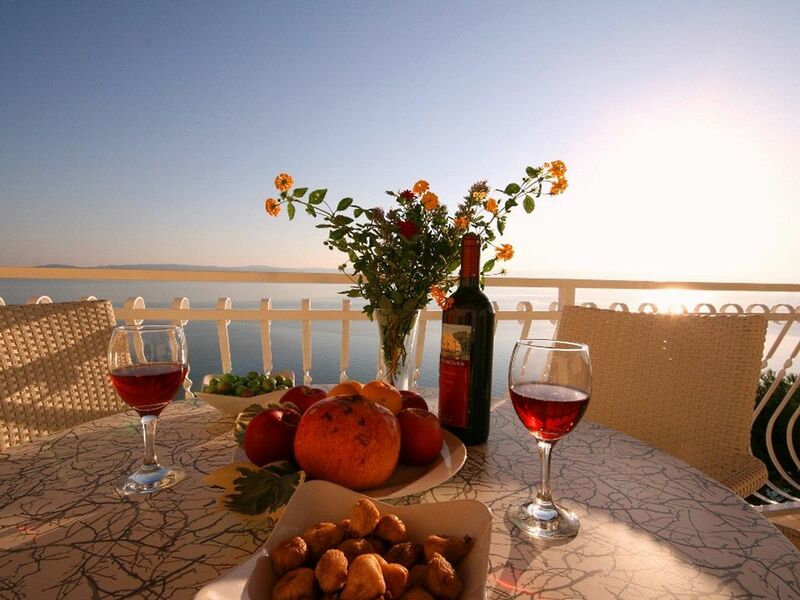 Our new vacation Villa is located directly at the sea and the apartment includes, terrace with tremendous views to the sea, as the matter of fact almost every room in the apartment has a balcony with view to the sea. Kitchen with dishwasher (new), microwave, coffee machine, large refrigerator with separate cooling area. FROM season 2017 - NEW sitting set and high quality furniture in the living area, bedroom etc. Fitness, free WIFI, BBQ place on the beach etc). Furthermore guests have kayaks and mountain bikes on their disposal on request. Special offer for free....: Our property has a) own parking place (video surveillance); b) private sandy beach with grill-place, laying chairs and sun umbrellas, shower on the beach; c) small rowing boat; etc. We were really happy in Villa Ruzmarina! Great view from the balcony, lovely private beach, crystal clear water and friendly staff. The apartment was spotlessly clean with a good layout (bedrooms at the back) and we slept really well there. We would definitely like to return. Beside a fantastic accommodation which met all our expectations concerning design, functionality, comfort and cleanness we highly appreciated the hospitality and warm hearted attitude of the owners and the staff. We simply felt wonderful and are sure that everyone who chooses Villa Rusmarina in Marusici will feel the same. Very good communications with the nearby town of Split (only 36 km away from the Split airport), possibilities of excursions to nearby islands, cultural summer festivals and theatre plays, numerous sport possibilities such as rafting in the magnificent canyon of the Cetina River, vast monuments from the past as the reminders of long and glorious history, small restaurants with characteristic traditional meals, good shopping possibilities…and much more. Golf: 35 km there is GOLF-place. Villa is situated above the private beach which makes the view so special. There are private steps to the beach (about 200-250) and there is Beach House where you can leave your beach equipment and you get the key.